Five hundred million years ago southern Britain was situated near the Antarctic Circle. Scotland was near the equator. During the next 70 million years, what became England and Wales moved about 3,000 miles north, and in the next period a continental collision between two tectonic plates created mountains over much of Britain. In the Carboniferous period, from 360 to 299 million years ago, a warm shallow sea deposited vast quantities of calcium carbonate from the remains of plankton, eventually forming the limestone that is seen in many parts of Britain. Later in the Carboniferous period, buried peat from the forests and swamps decayed and was compressed to form coal seams. By the end of the Permian era, 250 million years ago, Britain had caught up with Scotland and was in the middle of a vast super-continent in the Northern hemisphere. It was this slow journey North from deep in the Southern hemisphere that is partly responsible for the abundance of materials hidden below the surface of the earth that miners have “brought forth to the light” in the last 5,000 years or so, according to Geoff Coyle, in The Riches Beneath Our Feet. 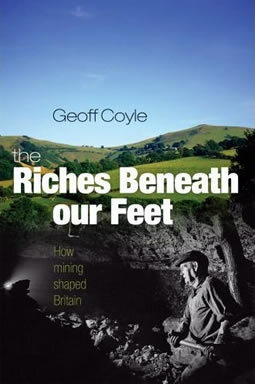 In a lucid, very readable narrative the author lays out an overview of the story of mining in Britain, from the Neolithic flint mining of 4,000 BC, through the Bronze Age when tin and copper was mined in Cornwall, Anglesey and North Wales to the lead and zinc mines in the Pennines and on to the mining of coal. In Cornwall, tin on the surface was exhausted by the mid 16th century, necessitating the construction of deep mines with the dangers of rock falls, flooding and falling down the shaft off a ladder ever-present. By 1780 Dolcoath mine, near Redruth, went down 600 feet. 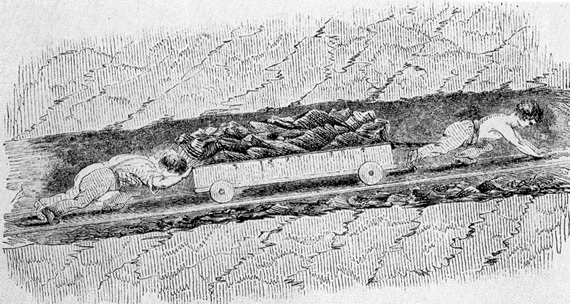 By the 1840s the copper ore in the mine was exhausted at 1,500 feet. Coal was by far the largest mining industry, employing at its peak at the beginning of the 20th century over a million men to produce 287 million tons a year. It provided the heat and power for the industrial revolution. In addition to the normal dangers inherent in most mines, coal mines had an unseen deadly danger, methane, which seeped out of the coal once the pressure was taken off it. This gas, Coyle explains, was not discovered until the 19th century, and for hundreds of years before that, miners faced a hazard – firedamp it was called – of which they knew little. Even after the invention of a light source that would not cause a methane explosion, miners were by no means safe. A pick striking metal, an electric spark or an accident with a lamp could set off the methane, sometimes killing hundreds at a time. In Sengenhydd, South Wales, in 1913 no fewer than 436 men and boys were killed in the worst mining disaster in Britain. From the start, coal mines employed children and women. 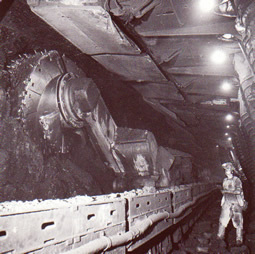 They had to cart the coal from the face to the shaft through narrow tunnels. Sometimes they were harnessed, like animals, to the baskets of coal. In Scotland the women, who made up about 25% of the workforce, carried coal on their backs up ladders. “A large basket would be loaded with coal and strapped to the woman’s head. A few more lumps were added at the back of her neck and then she set off up the ladder. Coal might well fall from her overloaded basket on to other women on the ladder and accidents of all kinds were common,” Coyle relates. The Mines Act of 1842 finally outlawed the employment underground of women and children under 10. The new legislation was bitterly opposed in the House of Lords. Lord Londonderry, whose income from coal was over £100,000 a year, wanted to continue with child labour. In 1850 four mining inspectors were appointed, marking the beginning of regulation within the industry. The author shows how mine workers and the industries they toiled in have shaped the social history as well as the physical appearance of the country over hundreds and even thousands of years. In addition to the descriptions of the mines in each industry as it developed, he has chapters on the mining people and their communities, the Lords and Adventurers (the owners of the mines), and one on accidents and disasters. It is a pity that he does not put the story of the decline of mining in Britain more firmly into the context of the globalised economy and the fluctuations of the world metals markets. His conclusion, that “it is difficult to say confidently that British mining has a bright future, but it is not dead, and there are some positive signs” is a rather limp end to an otherwise revealing account of the history of mining.